The RFU will not announce a successor to Eddie Jones this year, even though the England head coach could leave after this autumn's World Cup. The Australian is contracted until 2021 but may leave after the tournament in Japan, which concludes in November. His contract also has a break clause if England do not make the semi-finals. 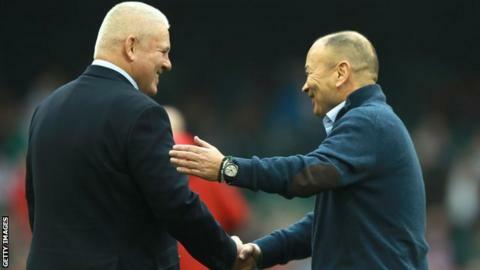 However RFU interim boss Nigel Melville says it is not lining up a big-hitter such as departing Wales coach Warren Gatland to take over post-Japan. "We don't want distractions going into the World Cup," Melville told BBC Sport. "We will make an appointment after the World Cup. Eddie's future is in his own hands. "He hasn't told me he is leaving, so that means he is staying - 2021 is his contract." Melville says Gatland, who has also led the past two British and Irish Lions tours, is in a "pool of world-class coaches" the RFU would be interested in but that there have been no conversations about the Kiwi making a dramatic move to Twickenham following the World Cup. Gatland will stand down from his position with Wales at the end of 2019 after 12 years in the role. But while the RFU risks missing out on a high-profile replacement for Jones if it continues to deliberate, Melville is confident the process is in hand. "That's for [the media] to be concerned about. We will be in a good place," Melville added. "We don't want to make a song and dance about this. "We know who we are looking at and we will continue to move forward without the glare of publicity and people trying to make our decisions for us." While the majority of Jones' backroom staff are out of contract after the World Cup, Melville has revealed forwards coach Steve Borthwick is on a continuing contract with the RFU, meaning he is tied to England for the long-term. This strengthens the former England captain's hand, making him a genuine contender to step up to replace Jones at some point in the coming years. "Steve is a member of the union and a staff member," Melville said. Regardless of his future with England, Jones has ruled himself out of coaching the Lions in 2021, saying the role is an "ambassador job". "The last thing I want to do is spend eight weeks in a blazer," he told the Brisbane Courier Mail. Melville says he does not think Jones was being disrespectful to previous Lions coaches with his comments. "It's just Eddie being Eddie," Melville explained. "He doesn't think the Lions is a fit for him, and that's his choice." Melville says World Rugby's vision for the Nations Championship is "very good and very strong", but says the Six Nations unions share "huge concerns" about the commercial damage relegation from the competition's top tier could bring. The proposed world league would globalise the international game and create a year-round tournament between teams in both hemispheres. But it would require the Six Nations unions not only to embrace promotion and relegation, but also to abandon both 'Project Light' - a plan for them to pool their commercial resources - as well as reject offers from private equity firms to buy a stake in the Championship. Melville says the Six Nations "absolutely" have a duty to support the global game, but the unions are "united in their concerns". "We all have a responsibility for the growth of the game, at Tier 1, at Tier 2, and in our own communities," he added. "Promotion and relegation from the Six Nations is all well and good as long as you have a [strong] Tier 2 tournament to drop into. Without that, and even with that, there are huge commercials concerns. "Those commercial concerns could mean we haven't got the money to put back into the community game to grow the game, and as a union that's the priority." The RFU will hold a board meeting on Wednesday to discuss its position, while World Rugby wants an answer in the coming weeks about whether the Nations Championship could be given the green light. "In two weeks we have to decide the way we move forward," Melville said. "We don't want to throw away good ideas; we want to use good ideas and build on it and make something better for the future of the game. "As a board we will meet to talk about our position and toss the ideas around, which ideas are most important to us, and which ideas would be the red lines to get in the way of it happening."